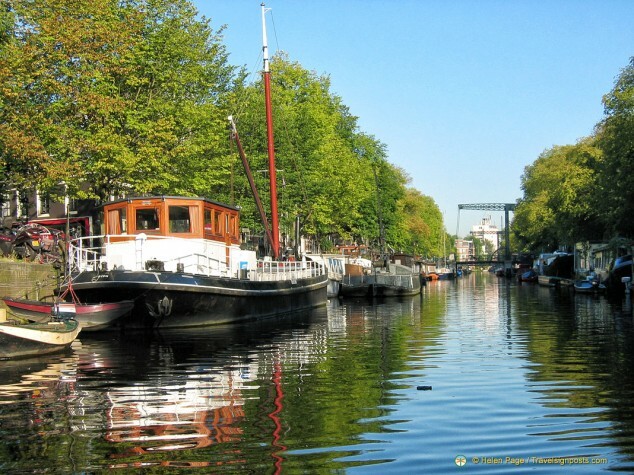 You are here: Home / Featured / Amsterdam’s Canals – "Venice of the North"
Amsterdam’s Canals – "Venice of the North"
Amsterdam canals make it “the Venice of the North”. Amsterdam is a city of canals and its network of canals has earned it the title of “Venice of the North”. 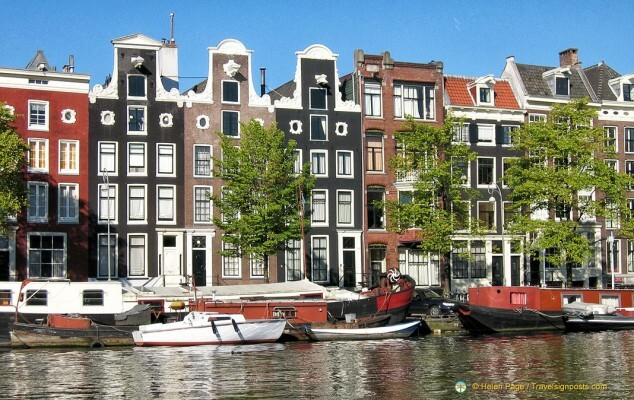 On any Amsterdam vacation, one of the must-do things is to go on a canal boat tour. If you’re on a Amsterdam to Budapest river cruise, this is one of the Amsterdam sightseeing tours you’ll most likely be taken on. After breakfast, we are transferred by coach to the canal boat mooring. There are some 150 passengers on the river cruise so several coaches are required. The Centraal Station canal boat embarkation point is not too far away and during the short journey, one of the most amazing sights for us is the number of bicycles in this city. We drive past a multi-storied bicycle station and there are literally thousands of bikes parked side-by-side. Our guide informs us that there are about 14 million bikes in the Netherlands to a population of 7 million. Each year some 70,000 bikes are stolen and many end up in the canals. As such, the canals are dredged for dumped bikes every two years. Canals in Amsterdam are called grachten. When the canals were originally built, there were intended for the transportation of goods rather than people. However, with the arrival of modern transport infrastructure like roads and rail links, the commercial importance of Amsterdam’s canals declined and canals now play and important part in the city’s tourist industry. There are many sightseeing tours that visitors can enjoy using the waterways to get around. One of the common sights on an Amsterdam canal tour is houseboats. We’re told that there are some 2,500 houseboats that are officially moored within the city perimeter. The gentle boat ride is very pleasant, especially as we have nice warm weather. 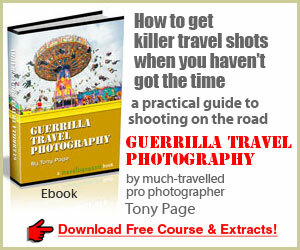 The keen photographers, and there are many in this group, are having a field day snapping away. Amsterdam is known as a city of “well mannered” architects as its architectural charms lie in the intimate and fine details of buildings rather than grand or opulent designs. One of the greatest pleasures of a canal tour is the opportunity to see lots of waterside mansions, apartments and heritage preserved buildings with elegant facades and ornate gables – most of the best ones are now the expensive offices of large organisations. To identify the houses of the rich, look at the size of the steps in front of the buildings and their fancy gables. For architecture buffs, this canal tour can be a game of ’spot the gable or facade’. Look out for a pair of houses known as the “twin brothers”. These are matching neck-gabled houses, believed to be two of the prettiest houses on the Grand Canal. See if you can also spot the spout gable, Rennaisance style, bell gable, shell motif, etc. If you notice a certain regularity in the sizes of building facades, this was due to planning laws in the 15th century. Due to instability of the topsoil, town planning required that facades be built of lightweight brick or sandstone, with large windows to reduce the weight. You’ll also notice that many of these canal houses are often long and narrow. As is common in the European cities in the past, taxes were levied according to the width of the frontage of a building and a narrow front meant lower taxes for the owner. 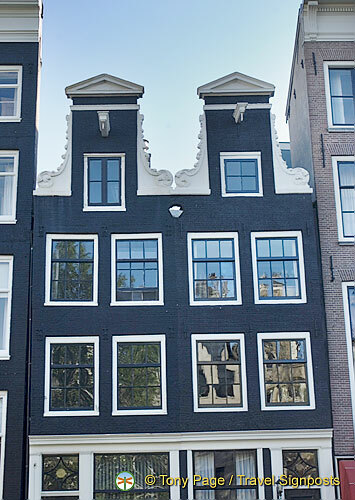 Another attraction on the canal tour is Anne Frank’s house near the Westerkirche. For those who were interested, The Diary of Anne Frank is one of the movies shown on our Amsterdam to Budapest river cruise. I’m not sure if all cruises show the film, but if you’re interested, you can get the book, DVDs and other Anne Frank memorabilia at Amazon.